Be a Rose is breaking the silence and raising awareness of how menstruation affects the success of women. 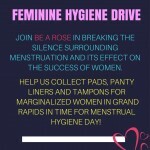 We invite businesses in Grand Rapids, Michigan to join us in an effort to conduct a collaborative feminine hygiene product (pads, pantiliners, tampons) donation drive in celebration of Menstrual Hygiene Day (MHD) on May 28, 2017. Organisation: Be a Rose, Inc.